The author was born in Winnipeg in 1881 and lived all his life at Little Britain. His sudden death in 1953 brought to an end his dream of writing in more detail of early life in his community. A great many changes have taken place since this was written. Early stories of the district tell us, that Little Britain was the name of the village of Lockport in the early days, so named by a Mr. Stevens, father of the man for whom Stevens Ave. was named. However, the first post office there was called North St. Andrews and kept by the late P. R. Young, an early merchant in the district. The school was also named North St. Andrews. The meeting house built by the late Hon. Donald Gunn for services of the Presbyterian Church was called Little Britain, and the name continued in Little Britain Presbyterian Church built in 1874. The purpose of this record is to give as accurate a picture of Little Britain as I can recall. I can remember the old log meeting house, also used as a school, which stood slightly north and west of a large stone dwelling house built by Mr. Gunn. A cairn, built of stones from that dwelling, marks the lot where these buildings once stood. Just north of Lockport School Road and on the river bank were the farm buildings of James McDonald, a brother of the late Mrs. Robert Hay. They were the usual log barn and house. Many of these settlers moved down to Clandeboye District with their cattle, as our district became more settled and their buildings gradually fell apart or were removed. Lockport School now stands on this property. The next settlers were Harpers. Mrs. Harper was related to the Loutits, descendants of the late Lowe Loutit, an early Scots emigrant. Then on to the late Duncan McRae’s home. He was the mason who built on the Lower Fort and all the early churches, of which we have numerous records. I remember well, my Mother taking me, on a Sunday afternoon, to visit at the McRae home. Mrs. McRae was an English woman of a very jolly disposition and most hospitable. Mr. McRae who was a Scotsman, became paralyzed in middle life and had lost the use of his legs. Not withstanding, he was quite happy and used to sit on a long wooden settee which had a tobacco knife attached to one end. I liked to watch him cut up his big plug of T and B tobacco for pipe use. He enjoyed his visitors very much. As a small boy, I thought he had a very loud voice. Mrs. McRae used to bring her knitting when she came to our home, knitting all the way there and back. I was fascinated with the speed at which she plied her needles. At the home of Mr. Ballendine and family there were four brothers and a sister, also an old lady they called “Auntie.” Two of the Ballendine brothers moved to Petersfield, the others remaining at Little Britain. They farmed and had a large herd of cattle, as well as a number of fine horses. The horses were raised in Petersfield and not broken until eight or nine years old. As the old North St. Andrews School, which I attended, was on the lot just north of Ballendine’s, I witnessed the breaking-in of some of these horses. John Smith known by everyone as “Little John,” lived on the river bank of the next lot with the old St. Andrews School farther back on the creek bank. “Little John” was also paralyzed in the legs, but that did not keep him from carrying on a very active life. Everybody was welcome at his home. He enjoyed nothing better than a good game of cards or checkers, of which he was a master - a very jolly man to the end. I could write much about North St. Andrews School, but the outstanding memory is that it was the demarcation line between the “up-aboves” who lived south of the school and the “down-belows” who lived north of the school, and the spot where these groups fought many a battle for supremacy. In the early days we sat in long hand-made wooden desks, several of us to a desk. My first teacher was Mr. T. H. Lougheed, later Dr. Lougheed and father of the health officer for Winnipeg. Adjoining the school ground on the north were the farms of Jimmy and John Muir. They raised a lot of fine cattle, offspring of sires brought out by the H. B. Co. in the early days. Next was the home of James Gunn, a son of the Hon. Donald Gunn. He was a tall old man and an elder in the church while he could attend. On this same lot and at the main highway lived an old retired H. B. Co. servant whose name was Wm. Foubister. There was always a road along the river bank. Where this road turned west from the river was the original “Hawthorne Lodge” built by Chief Factor John Edward Harriott in 1858, of log frame, filled with stone, a full two stories high. As a boy, I remember it being occupied by Doctor David Young, who was then in charge of the Mental Hospital at Selkirk. There used to be a beautiful rustic bridge over the creek, just west of the residence, and a driveway which circled south from the front of the residence and back on the brow of the hill to the bridge. Well do I remember Dr. Young’s bay team of hackneys with brass mounted harness and his beautiful phaeton, so the family drove down over their service bridge on the way to Selkirk. As a boy, I often heard it said that those who found employment at what was fondly called “The Big House,” were very fortunate as there was always lots of fun as well as work to be had. Dr. Young and his family were very friendly. On the west side of the creek was the home of Bernard R. Ross, a retired H. B. Co. official. At the main highway, about the centre of the lot was a residence and at the north side, a two storey log building. On the main floor was a store operated in my day by a Mr. Fox. The upper storey was, I think, the first Masonic Hall. A stair on the south side was built up to the hall. At one time this part of the settlement was called Caledonia. However it became bettdr known as Brookside when it was a thriving business area in the 1870s. Thomas Flett owned the next lot. He was a retired H. B. Co. servant and farmer. The ferry landed at the front of this lot and was one of the attractions of the district, especially the annual event of laying the cable, at which time men came from far and near to lend a hand. Sometimes the cable was carried down by the strong current and would be caught by the rocks in the bottom of the river, in which event it might take a day or two to complete the operation. There was always a liberal supply of refreshments, both solid and liquid and as time passed spirits rose to a point of exuberance. The cable was hauled and made fast to the “dead-man” buried in the river bank and we had connections with the East Side for another summer. The Ferry Road out to the main highway was on the Cox lot. Mr. Cox was another H. B. Co. retired servant. I should mention here that people crossed to church and funerals free on the ferry. It was a common thing to see the ferry crowded with Church people on Sunday afternoon or evening as service was sometimes changed. Before Lockport Bridge was built and even after, the Ferry Road, on both sides of the river, was an artery of traffic for miles around. I can remember seeing Germans with their settlers’ effects and beautiful horses, crossing by the Little Britain Ferry on their way to settle in the Beausejour District. At another time the C.P.R. train stopped at Little Britain where the track was about half a mile east of the main highway. About two hundred men and women walked from the train, crossed on the ferry and walked south to what is East Lockport now. This expedition was headed by Dr. George Bryce and the purpose was to open up a couple of Indian mounds in which a number of skeletons and relics of early Indian tribes were found. I remember these people returning in the evening of a hot summer day and boarding the train to return to Winnipeg. My father H. M. Johnstone, who had come out from the Orkney Islands in 1856, as a blacksmith for H. B. Co. and had later set up his own business in Winnipeg, moved to Little Britain in 1883. He built a shop on the main high-way at the Ferry Road. The frame was made of oak logs that had been the frame of the H.B.Co. flour mill operated at Lower Fort Garry for many years. Blacksmithing was a busy trade in those days, especially when it was icy and both horses and oxen had to be shod. The wild ones provided plenty of excitement for the young boys. On the lot next to Coxes was the home of Donald Ross, another H. B. Co. officer. It was a large house constructed of log frame filled with stone. This house and property were later owned by Alfred Franks who was employed by the H. B. Co. until retirement, first at Lower Fort Garry and then in Winnipeg. The Donald Ross house burned down about 1919. This was one of the homes in which Dr. Schultz found refuge at the time of the first Riel Rebellion. The next lot was known as “Cobber Fae.” On it stood a long, low, log house, lathed and plastered outside and in, built by a H. B. Co. factor named McKenzie. My earliest recollection of this house was that it was abandoned so it was one of the places we used to “explore.” There were several rooms and a fireplace. The finish on the outside was blue and it had a thatched roof. Then came the lot transferred by Gov. Dallas from the H. B. Co. in 1864, to the Congregation of Little Britain Presbyterian Church. On it were erected a stone manse in 1872 and a stone church in 1874. A cemetery, where you will see many of the old names, surrounds the church, beautifully situated not far from the river. My first recollection of a pastor in the manse was of Rev. Alexander Matheson, a man of great zeal and energy. Being interested not only in the spiritual welfare of his flock but also in the physical welfare, he promoted gardening and showed the people how to grow many vegetables. Unfortunately the old stone manse was demolished in recent years, which somewhat changes the picture of the labour of the early pioneers. The church was thoroughly repaired in 1948. On the next lot to the church was a log house occupied by James Linklater and family. He was precentor in the church at one time and I saw him use a tuning fork to get his “pitch.” James McDonald, whom I spoke of earlier, was the first precentor in the stone church and received a small salary. We now come to the old “Travellers’ Home,” owned and operated by Wm. Porter, an Irishman and an old '49 gold miner. He was an ideal character to run a stopping place in the early days, kind and hospitable, consequently it was a place of considerable activity. Wm. Peel, another Irishman, had a liquor store across the road and Alex McPherson, a Scot, had a general store beside Peel. Mr. Peel later moved to the Cloverdale District and became famed for his good stock and garden. He took many prizes at the Selkirk Fair. North of the “Travellers’ Home” lived a quaint old Irishman who was a wonderful gardener and liked fast horses. He was one of the kindest men you could meet and if the weather was bad he would come to the school with his team and sleigh to take home as many as he could pack in. Next was the home of Sandy Gunn, a farmer and son of Hon. Donald Gunn. Then the home of John McDonald at the river and his liquor store at the highway. This store later became the St. Andrews Municipal Hall in which John McDougald was Secretary Treasurer, until the Municipality moved its office to Clandeboye. The next lot was owned and occupied by Norman Morrison, a Highland Scot and a retired blacksmith for the H.B.Co. He was a great Sunday School and Church worker. His family all took an active part in Church affairs until they moved to the Meadowdale District where they became active in Cloverdale Church. The lot next to Lower Fort Garry was owned by Mr. Able, an engineer in the H. B. Co. flour mill. The house was abandoned as I knew it. That was our settlement of Little Britain. Today it is greatly changed. The only people who have kept their land in the family are the Fletts. 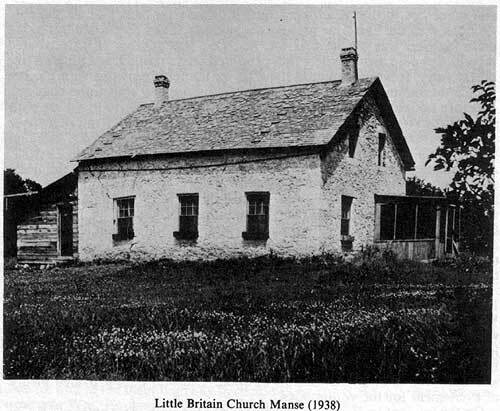 The United and Roman Catholic Churches perpetuate the name of Little Britain, one of the oldest settlements along the Red River.